Love the pincushions! I love the idea of making them from precious scraps of Liberty too! Very cute! Tiny things are a win all around -- they take a small amount of time and materials but have a big impact when finished. Love your pincushions. I am obsessed with making them and have a wooden box full of them! I'd love to win this book. These pincushions are so cute. Beautiful work with the fussy cutting! Such cute little pincushions! I love them both! Ooooooow! What a cute book and pincushions; pick me!!! 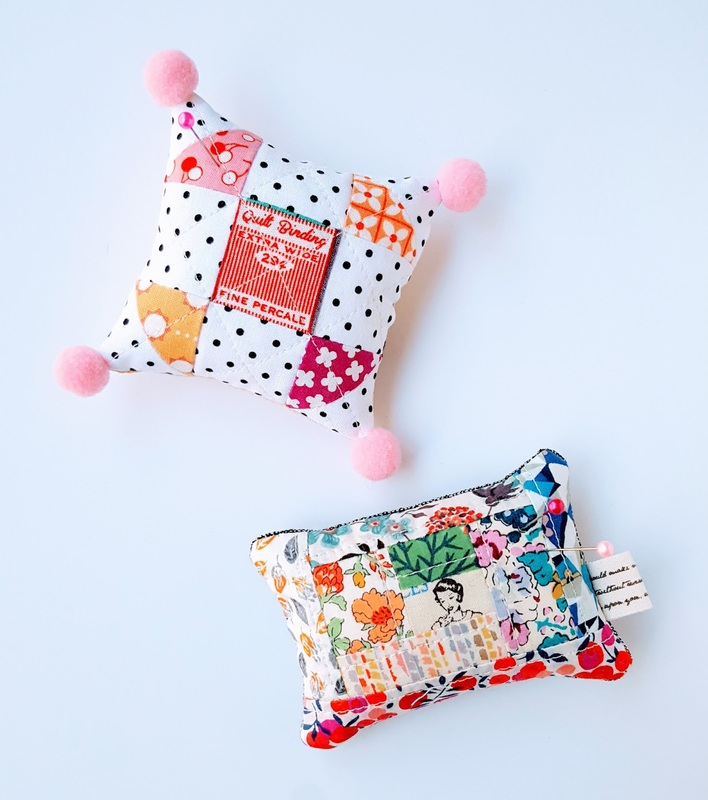 Very sweet pincushions (I love the pom poms on the corners of the shoo fly cushion!). Such sweet little pinnies! You can never have enough - at least that's what I keep telling myself! Those pom-poms are so adorable! Your daughters have it right. Also loving the Liberty pincushion. Looks like a fab book. Pin cushions are so much fun to make! Love your version...adorable! Oh, your pincushions are so cute! Would love to win a copy of the book, thanks for the chance. These pin cushions are just perfect! The book looks so cute and your projects are adorable! Thanks for the chance to win a copy! So when I win you can email me right away! Well thank you so much for a chance at this awesome giveaway!!! 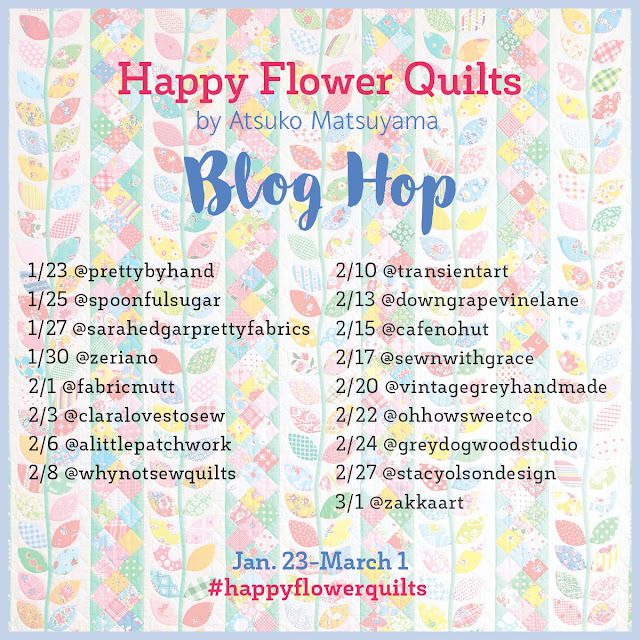 I am so excited to follow along on this blog hop too, hoping to get a copy of this awesome book soon!!!! 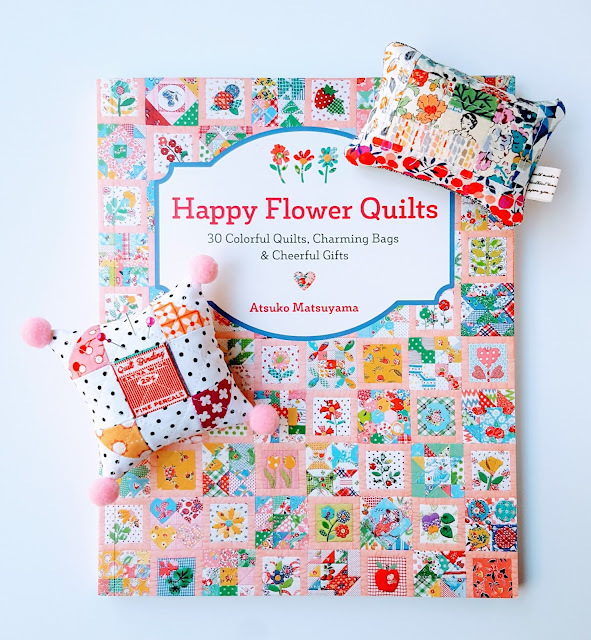 I was just looking at this book the other day and trying to decide if I should buy it or not (I've got a kigillion quilting and project books). Your pincushions are adorable, especially the one with the pompoms! Your pincushions are gorgeous and precious! Thanks for the chance to win this fabulous book! Such sweet pincushions! They'd look so cute set around a sewing room or to give as gifts. This book looks wonderful and is just my style! Absolutely LOVE that Liberty pin cushion!!! Wouldn't mind winning the book, either. Beautiful pincushions. Love the fabric choices! Thank you for the chance to win. Adorei a escolha dos tecidos! Ficaram umas almofadas de alfinetes lindas! Adorava ser a feliz contemplada, ganhando o livro! Tiny pompoms make all the difference. Looks like a fun book! What cute pincushions! I love the cover of the book, so many pretty quilt squares! Pincushions are the best! And you can use up those scraps that you just can't throw away. BTW, I love the name of the book - who doesn't want to make cheerful gifts this time of year! Cute pin cushions. The book looks interesting. Adorable!! Love the dash of charm the pom-poms give! Love those pincushions. You can never have enough of them. Thanks for sharing this book with us. i love pincushions and the prints you used are gorgeous. thanks for the giveaway. So adorable I could scream! Thanks for the opportunity! Your pin cushions are so cute! Small and cute projects are the best. Thank you for the chance to win this lovely book. Très jolies réalisations.J'aime beaucoup ce livre. Tu as mon adresse mail via mon inscription à ton blog. Neat 'lil Pin Cushions! Love to win a copy>looks like a great book! You can never have to many pin cushions! there is just something about them. Once you get one, you just have to start collecting more. Would love to have the book. Adorable pincushion! Such cute fabric. your pincushions are so cute! This book looks very fun and inspiring! Thanks for sharing your darling pin cushions. This book looks like it would be so much fun to work through. Thanks for the chance. The book looks great.So gorgeous pincushions, the one in the left caught my eye.I love gift pincushions.Thanks for the chance! I love the cute pin cushions and the book is too sweet. What is it about pin cushions that enchants us so? I have made several myself, and when I find a pattern for another one that charms me, I make it too. Thanks for the chance at the giveaway. Thank you so much for this opportunity to win this great book. If I win, can I win the pin cushions instead? :D They are SOOOO CUTE!! So cute, I love the pincushions. Love your pincushions. Looks like a fun book. Pincushions are adorable-I love little projects like that-love the fabric you chose. It has been so fun to see everyone's projects. Thanks for sharing your sweet pincushions! Lovely book! Thanks for the chance! Too cute! I would so like a copy of this book. Thanks for the chance. Those pin cushions are adorable! I would love chance at the book. It looks like it's full of wonderful things to make! Thank you!!! what darling pincushions! Would love to be winner! Those are awesome pincushions. I wish everyone good luck, but secretly hoping I win!! Ha. Ha. The pincushion with the pom poms is adorable. The pom poms are a beautiful finishing touch. Pincushions are such fun projects--ways to keep special fabric close-by, or make a quick gift for a dear someone. Your pennies are especially sweet; you always include fun little touches. I hoard even the tiniest scrap of Liberty. A pincushion is ideal for some of those. Adorble project!! thank you for the giveaway! Sweet pincushions. Thank you for the giveaway. Have a lovely weekend. The more I see of this book, the more I love it! Cute pincushions! The Liberty print pincushion is great. I've been following the blog on this book and it looks delightful. I would love to add it to my quilting library. Thanks for the chance. sherry (at) phazoncontrols (dot) com. I just started making pin cushions. They're a great way to create something when time is short. The book looks lovely - so much inspiration! Thanks for the chance! This book looks really interesting and your pin cushions are lovely. I really, really need a quilting book. I'd like to win this one! You can always use more pincushions, they look great. 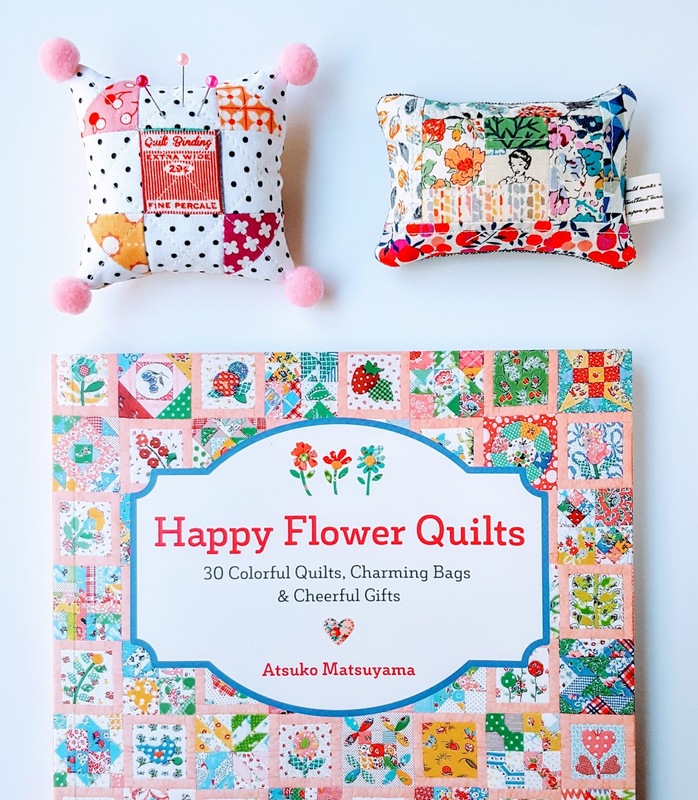 Your pincushions are adorable, I would love to win this book, thanks for the chance! I remember looking at this book a few years ago but it was not printed in English at the time. It is just adorable and that cover quilt is amazing. Love the pin cushions as you can use all those "just can't throw away this cute piece" of fabric we all have. Thanks for the chance to win this book! Another lovely book for my library! I love your pincushions and the log cabin one is my favourite too. This looks like a lovely book. I love pincushions also. One of my first sewing projects as a child was a ladies' hat pincushion. Thank you for sharing and for the giveaway. Lovely book and projects... hoping to win a copy.